Honor your employees amazing accomplishment with the Crystal Peak Award. The 6.75”H x 6.75”W peak is a solid way to show you care about them. 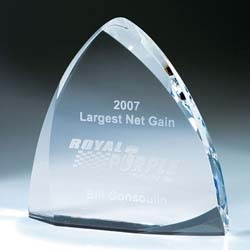 Engraving of your text, logo, and personalization is all included in the low price.